The Star Wars video game in production from Visceral is still two years away, but the team is hard at work on developing the first non-Battlefront game from EA since they acquired the Star Wars licence in 2013. The team is led by creative director Amy Hennig, who was also creative director on the Uncharted series. We were given our first look at the game back at E3 earlier this year. Hennig spoke with Glixel recently about her career and offered a few hints and tidbits about what it's like working on Star Wars. 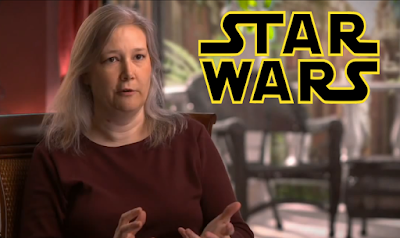 Hennig revealed that she was initially hesitant about taking on the Star Wars project, which was described to her as a "'scrappy' third person action adventure". She told Glixel, "Imagine how heartbreaking it would be, to work on something I love so much only to be crushed under the combined wheels of EA, Lucasfilm and Disney." "There's this giant warehouse full of Home Depot shelves stacked with precious things from your childhood. Luke's Stormtrooper costume, the original Yoda, just kind of saggy and slumped over on this dusty shelf...it's almost silly, seeing all this precious stuff just sitting there so unceremoniously." "almost like theater. The actors gather on a sound stage and act out each scene with no breaks – skin-tight lycra suits, marker dots on the face, helmet cameras – and stuff sometimes does go wrong: an errant elbow, or someone looking the wrong way. But that stuff can be fixed later. All Hennig cares about is getting the feel of each scene correct by having the actors reacting to each other in a way that feels natural." It sounds like Hennig is continuing the tradition established by Star Wars Rebels and Star Wars: The Clone Wars of bringing all the performers together for recording sessions (which is unusual in video games and animation), though she is taking it a step forward by having the performers doing motion capture.